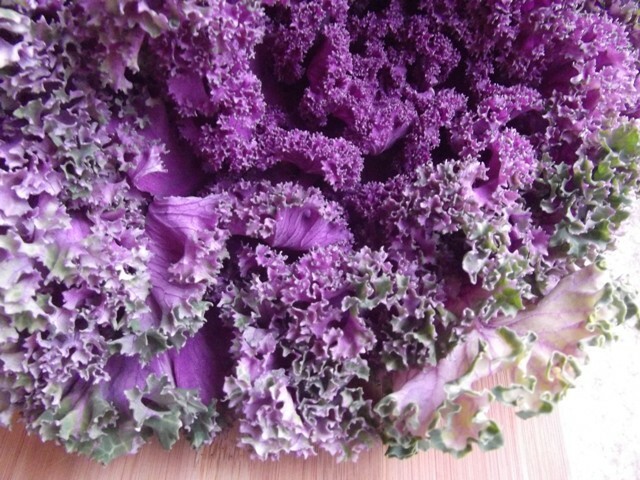 This past week, I have been inexplicably drawn to purple vegetables. I’ve bought turnips rimmed with a violet blush, potatoes dark as over-dyed denim, two kinds of purple yams, and that jewel-hued bunch of kale. Maybe it’s that purple suggests nutrients I’ve been lacking – it’s been a long winter of dark leafy greens and sweet potatoes and chickpeas – or maybe it’s that I am so very tired of winter and am ready to just get on with spring already. Maybe it’s that everything seems so grey and cold and apocalyptic right now, and purple suggests whimsy, a decadence we couldn’t afford if it came in any other form. Whatever the reason, if it’s purple it’s getting stuffed into my shopping bag. 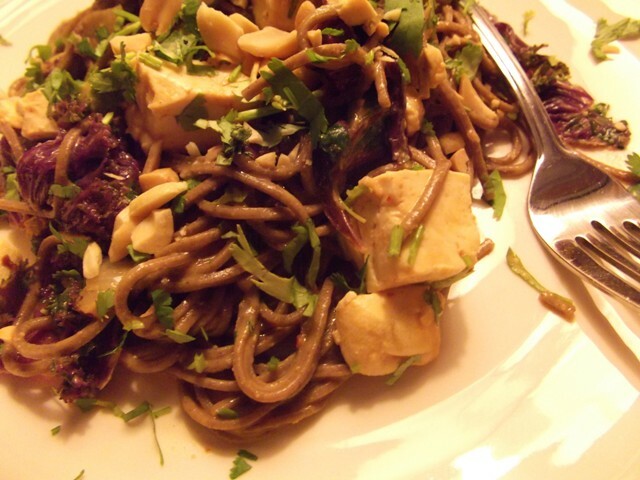 You don’t have to use purple kale here; green would be perfectly lovely and probably more aesthetically pleasing – the purple with the soba and the peanut butter got a little lost. Purple desire aside, I was willing to overlook a sub-par presentation because this came together in under 15 minutes; the longest part was waiting for the water to boil. Perfect for this Meatless Monday, or anytime it feels like March or the end of the world. In a large pan, over medium-high heat, heat oil and add onion, garlic, and ginger. Cook until fragrant, about two minutes. Pat tofu dry with a kitchen towel and cut into cubes. Add to the pan, tossing occasionally. Meanwhile, bring a large pot of water to a boil. Add soba noodles, and cook for three minutes. Meanwhile, combine peanut butter, soy sauce, sriracha, rice vinegar, sesame oil, and honey in a bowl. Mix well, taste, and adjust seasonings as needed. After three minutes, add kale to the pot. Cook an additional three minutes, then drain. Rinse with cold water and drain again. Add noodles and kale to onion mixture, and pour sauce over top. Toss with 1/2 cup of the fresh cilantro. 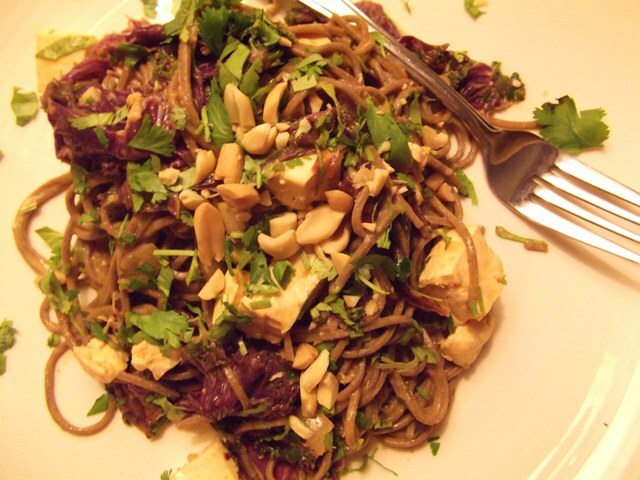 Divide between four plates, and garnish with remaining cilantro and chopped peanuts. This would also be good with chopped scallions and fresh bean sprouts. We might have had those things if I wasn’t only buying purple stuff. mmmm soba noodles. and kale…mmmmm and peanuts. I might have to make this for lunch one day, since The Heathens eschew any form of kale vociferously.